Return to Home > Testosteron-Boosters/ tribulus>Trec - GH Turbo - 120 caps. Trec - GH Turbo - 120 caps. 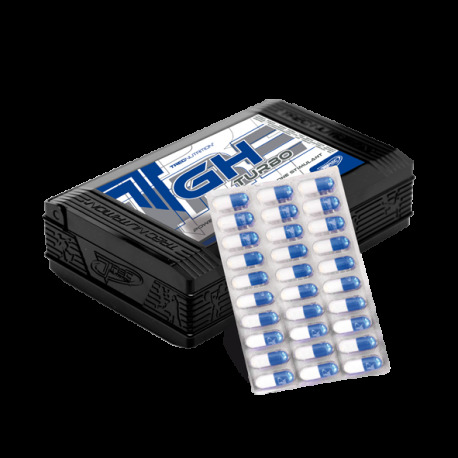 GH Turbo contains a unique composition of amino acids which are helpful in stimulating somatotropin (Human Growth Hormone) secretion. Maintaining high levels of this endogenous hormone is extremely important for athletes and active individuals to ensure top performance. Somatotropin increases lean body mass gain and reduces the reserves of adipose tissue, intensifies energy production, helps your libido and accelerates the recovery of the whole body, especially following an intense workout. The recommended daily allowance is 3–6 capsules, preferably 30 min. before bedtime. Wash down with approx. 300 ml of water. NOxGrowth Stimulator [L-arginine alphaketoglutarate; L-ornithine alphaketoglutarate; L-arginine nitrate; L-arginine malate; L-norvaline; citruline malate]; Night proGH Formula [L-lysine hydrochrloride; L-tryptophan; L-theanine; L-glutamine; L-glycine; N-acethyl L-glutamine]; magnesium stearate – anti-caking agent; gelatine (A)/cellulose (B) – capsule shell (See the symbol before batch number).